The biggest source of early LG G6 information is LG itself, and at this point many of the key details have been confirmed, including, as of today, the material the phone will be made from. In a tease on its US website, LG has revealed that the G6 will have a “sleek, full-metal body”, ending the debate over whether it will be metal or glass. 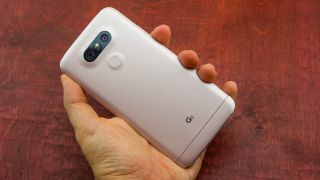 The information isn’t accompanied by any images, and as technically the LG G5 was metal it’s possible the G6 will look similar, but we doubt it, as previously leaked images suggest we’re getting a shiny finish, with none of the paint LG slathered over the G5. The site also confirms a “state-of-the-art fingerprint scanner”. It’s not clear what will make it state-of-the-art, but presumably it will be fast and accurate, and its inclusion is no surprise, since almost all flagships now have fingerprint scanners, including previous LG ones, and leaked images show a rear-mounted scanner. Elsewhere the site reiterates things that have been teased before, including a waterproof design and a “camera that captures it all at once” – which LG has already revealed the details of separately, so we know it’s talking about a dual-lens 13MP snapper with a wide-angle option. Finally, the site promises other “premium design details” which at this rate we’ll probably know all about ahead of the phone’s official unveiling on February 26.